Diana Furchtgott-Roth and Jared Meyer have an article in the Federalist discussing the hypocrisy of members of Congress who advocate for higher minimum wages while paying their interns nothing. It is worth a read, but rather than excerpt it, I wanted to add another example. The example comes from the world of private operation of public parks, the business my company is in. We keep parks open by operating much less expensively than can the government, usually using only the fees paid by park users without any additional tax dollars. Last year, Barack Obama issued an order raising the minimum wage of Federal contractors to $10.10 an hour. Though concessionaires like us are normally thought of legally as tenants of the government rather than contractors, the Department of Labor wrote the rules in such a way that this wage order would apply to concessionaires that operate Federal parks, such as those in the US Forest Service's campground concession program. As a result of this order and similar minimum wage increases by the State of California, a concessionaire (not our company) that ran campgrounds in the Tahoe National Forest in California informed the Forest Service that it would need to raise camping rates to offset these minimum wage increases. As an aside, wages and benefits that are tied to wage rates (e.g. workers comp and payroll taxes) make up about 50% of a private concessionaire's costs. So if minimum wages go up, say, 20%, then (given the very low margins in the business) a 10% price increase is necessary just to stay even. The Tahoe NF rejected the fee increase request, despite the fact that the concessionaire turned over its books to show that it was losing money at the higher minimum wage rates. So what did the Tahoe NF do? It took over operation of the campgrounds itself, ending a successful 30-year partnership with private operators. How did it solve the minimum wage issue? Simple! Minimum wage laws don't apply to the Federal government. So it will use dozens of volunteers who are paid nothing to operate the campground. 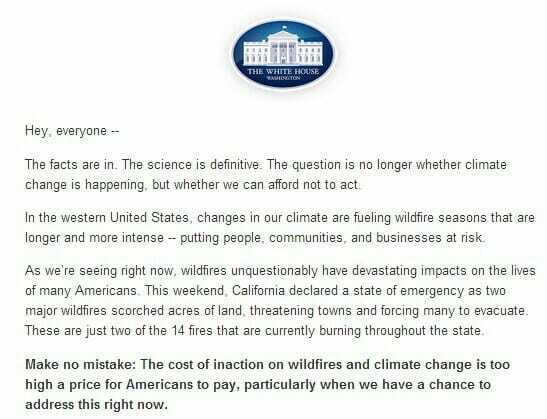 In other words, at a time when the President believes it is a burning priority to make sure every campground worker makes at least $10.10 an hour, the US Forest Service is firing private, paid workers and replacing them with volunteers. By the way, even using volunteers, the US Forest Service will STILL be paying more to operate the campgrounds than it did with the concessionaire. Under the private partnership, the private operator paid all expenses and paid the US Forest Service a concession fee, essentially rent. The campground's operation and maintenance were paid for entirely with user fees, and the USFS actually made money from the operation. Now, even with volunteers, the USFS operating plan shows it using $2 million of taxpayer money over the next five years in addition to user fees to keep the parks open. Update: Despite the original (stated) reason for taking over the campground, and despite using dozens of unpaid laborers, the USFS still had to raise customer rates in the end -- higher than the original private concessionaire proposed! The White House letter demonstrates the behavior that drives me crazy and caused me to start this feature in the first place. 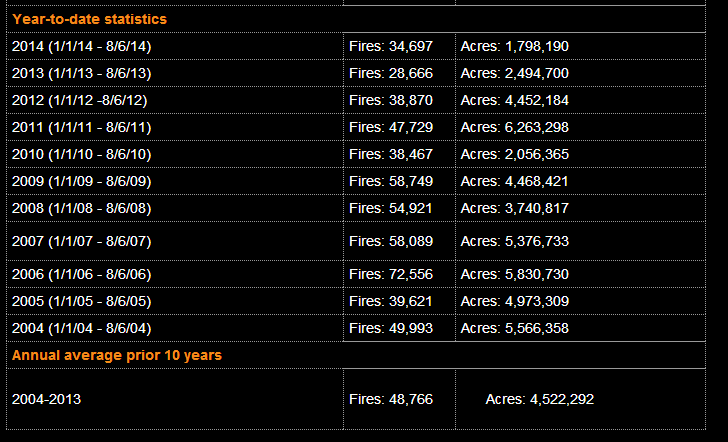 They point to 14 fires in California and imply that this proves some kind of trend. But how can an individual data point say anything about a trend? 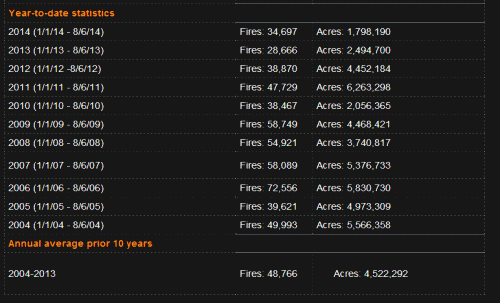 In fact, as you can see above, there almost 50,000 wildfires by this point each year. So what does the existence of 14 mean, one way or another, in establishing a trend? Just to show that I don't underestimate the impact of fire, one of these two fires referenced in the White House letter is actually threatening my business near Burney, California and has caused us substantial losses due to lost revenue (for some odd reason people don't like to come out to a park when the air is filled with smoke and ash -- go figure). PS -- There is an upward trend in the data vs. the 1950s and 1960s which is likely tied somewhat to climate but also somewhat to forest management practices. Academics have had trouble separating the two. Why is the Federal Government Feeding My Account Information to Spam Marketers? If you signed up for Obamacare, and then suddenly had a ton of spam in your email box trying to sell you stuff tailored to your pre-existing health conditions and other private health information, you would be pissed, right? I am registered merely because I have one tiny contract to clean bathrooms in California and I cannot get paid unless I am in the system. I checked my settings in the various government systems to confirm that yes, indeed, I had set it to not display my information publicly. But that does not seem to do a bit of good. Everyone on the planet seems to have my email, my name, and my account expiration dates and CAGE code. Wonderful. I know what you are thinking -- in this post title Coyote has engaged in some exaggeration to get our attention. But I haven't! Felix Salmon actually says this, in reaction to a group of CEO's who wrote an open letter to the feds seeking less deficit spending. There are lots of serious threats out there to the economic well-being and security of the United States, and the national debt is simply not one of them. Nor is it growing. The chart on the right, from Rex Nutting, shows what’s actually going on: total US debt to GDP was rising alarmingly until the crisis, but it has been falling impressively since then. In fact, this is the first time in over half a century that US debt to GDP has been going down rather than up. So when the CEOs talk about “our growing debt”, what they mean is just the debt owed by the Federal government. And when the Federal government borrows money, that doesn’t even come close to making up for the fact that the CEOs themselves are not borrowing money. Money is cheaper now than it has been in living memory: the markets are telling corporate America that they are more than willing to fund investments at unbelievably low rates. And yet the CEOs are saying no. That’s a serious threat to the economic well-being of the United States: it’s companies are refusing to invest for the future, even when the markets are begging them to. Instead, the CEOs come out and start criticizing the Federal government for stepping in and filling the gap. If it wasn’t for the Federal deficit, the debt-to-GDP chart would be declining even more precipitously, and the economy would be a disaster. Deleveraging is a painful process, and the Federal government is — rightly — easing that pain right now. And this is the gratitude it gets in return! 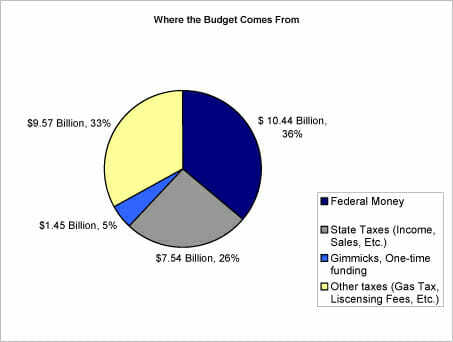 So when the CEOs talk about “our growing debt”, what they mean is just the debt owed by the Federal government. Duh. Of course they are talking about the government deficit and not total deficit. But he is setting up the game he is going to play throughout the piece, switching back and forth between government debt and total debt like a magician moving a pea between two thimbles. We can already see the game. "Look folks debt is not a threat, it is going down", but it is going down only at this total public and private debt number. The letter from the CEO's made the specific argument that rising government debt creates current and future issues (see: Europe). Just because all debt may be going down does not mean that the rise of one subset of debt is not an issue. Here are two analogies. First, consider a neighborhood where most all the residents are paying down their credit card debt except for Fred, who is maxing out his credit cards and has just taken out a third mortgage. The total debt for your whole neighborhood is going down, but that does not mean that Fred is not in serious trouble. Or on a larger scale, take consumer debt. Most categories of consumer debt are falling in the US. But student debt is rising alarmingly. Just because total consumer debt may be falling doesn't change the fact that rising student debt is a serious threat to the well-being of a subset of Americans. What?? Whoever said that the role of the Federal government is to offset changes in corporate borrowing? In his first paragraph, he already called the rise in total debt "alarming", and I get the sense that both CEO's and consumers agree and so they have been trying to reduce their debts. So why should the Feds be standing athwart the private unwinding of an "alarming" problem? And how does he know CEO's and their corporations are part of this deleveraging? I see no evidence presented. Corporate debt is but a small part of total US debt. Corporations may be a part of this, or not. In fact, they are not. Corporate borrowing in the securities market has increased almost every quarter since 2008, such that total corporate bond debt is about 10-15% higher than in 2008 (see third chart here). 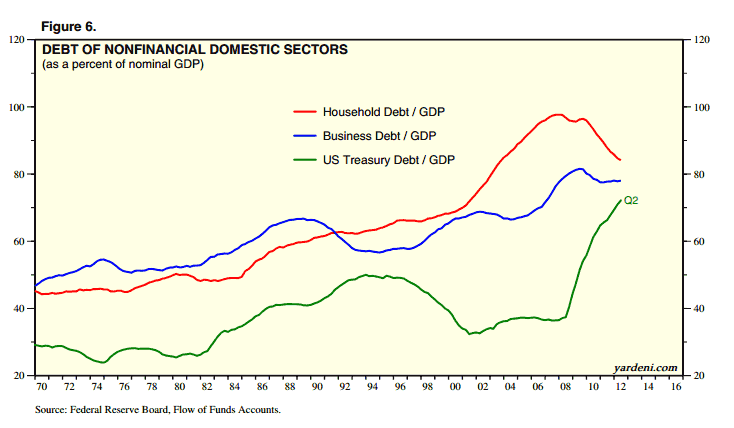 And here is total debt to GDP broken down by component (this is for non-financial sectors) source. 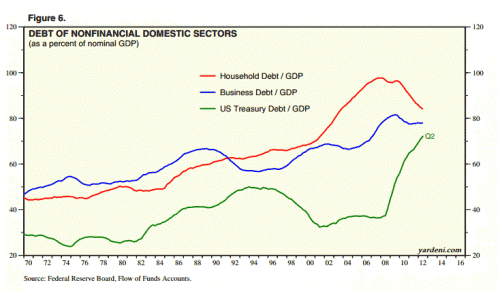 Government debt is basically offsetting the consumer deleveraging. Since consumers have to eventually pay this government debt off, as they are taxpayers too, then the government is basically flipping consumers the bird, forcing them to take on debt they are trying to get rid of. Hard working consumers think they are making progress paying off debt, but the joke is on them - the feds have taken the debt on for them, and the bill will be coming in future taxes for them and their kids. He might argue, "this is Keynesianism." But is it? If corporations are actually deleveraging, we still don't know how. Is it through diverting capital investment to debt repayment (as I think Salmon is assuming) or are they raising capital from other sources and rejiggering the right side of their balance sheets? And even if this deleveraging is coming at the expense of corporate investment, I thought Keynesians virtually ignored investment or "I" in their calculations (you remember, don't you, from macro: C+I+G+X-M?). In fact, if I remember right, "I" is treated as an exogenous variable in the famous multiplier "proof". This is the real howler -- that "markets" are sending a low-interest signal. Markets are doing nothing of the sort. The Federal Government, via the Fed, is sending this signal with near-zero overnight borrowing rates and $30-$40 billion a month in money printing that is used to buy up government debt from the market. If any signal is being sent at all, it is that the Federal Government is main economic priority is continuing to prop up the balance sheet and profitability of major US banks. Investment is also not solely driven by the price of funds. There must be opportunities where businesses see returns that justify the spending. Unlike the Federal government, which is A-OK blowing billions on companies like Solyndra, businesses don't invest for the sake of spending, they invest for returns. A soft economy combined with enormous government driven uncertainties (e.g. what will be our costs to comply with Obamacare) are more likely to affect investment levels than changes in interest rates. This is where economic thinking has ended up in 2012: To Salmon, it does not matter where the Federal government spends this money, so long as it is spent. He never even tries to justify that the government is running up debt in a good cause, because what it spends money on does not matter to him. For him, the worst possible thing for the economy is for people to spend their money paying down debt. Spend it on more drone strikes or more Solyndras or more squirrel research -- it does not matter to Salmon as long as the money is used for anything other than to pay down debt. Here is the bottom line: Businesses and individuals are trying to reduce their debt. And many hard-working people think they are being successful at this. But the joke is on them. 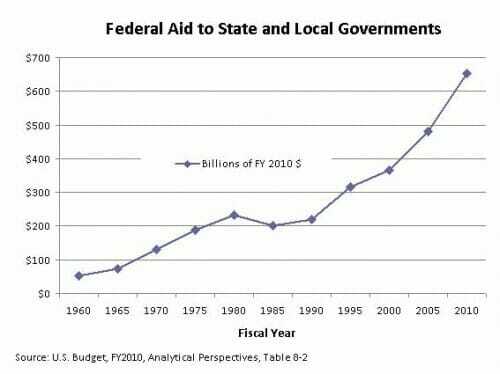 The government is running up trillions in debt in their name, thwarting American's desire to de-leverage. Mr. Salmon wants us to thank the government for this. Hah. All-in-all, this is an awful argument to try to justify Congressional and Presidential fecklessness vis a vis the budget. "¦.a federal judge has just ruled that the federal government can force me to purchase a product from a private company, under the argument that my not purchasing that product affects interstate commerce. For those of you who support this ruling: Under an interpretation of the Commerce Clause that says the federal government can regulate inactivity, can you name anything at all that the feds wouldn't have the power to regulate? And if you can't (and let's face it, you can't), why was the Constitution written in the first place? As I understand it, the whole point was to lay out a defined set of federal powers, divided among the three branches, with the understanding that the powers not specifically enumerated in the document are retained by the states and the people. But if that set of powers includes everything you do (see Wickard and Raich), and everything you don't do (what Obamacare proponents are advocating here), what's the point in having a Constitution at all? Respondents Diane Monson and Angel Raich use marijuana that has never been bought or sold, that has never crossed state lines, and that has had no demonstrable effect on the national market for marijuana. If Congress can regulate this under the Commerce Clause, then it can regulate virtually anything and the Federal Government is no longer one of limited and enumerated powers. Does Anything Exceed the Commerce Clause Nowadays? A question has been going around on legal blogs -- "Does a Federal Mandate Requiring the Purchase of Health Insurance Exceed Congress' Powers Under the Commerce Clause?" Unfortunately the theory that this personal use in California could somehow affect marijuana pricing in other states (by growing their own, they reduced demand for out of state weed which might affect prices in Arizona -- again similar to an argument that growing your own tomatoes might affect prices in another state) won the day in the Court. With the Supreme Court accempting this "butterfly effect" argument (because truly the demand of one person in a national market is like a butterfly flapping its wings in China and affecting a hurricane in the Gulf of Mexico), anything falls under the commerce clause. Adding up all of the cases in which the Court found statutes exceeded all of the federal government's enumerated powers, including the sovereign immunity cases, the commandeering cases, and the 14th Amendment cases, in the last twenty years still doesn't get us to the three-dozen-plus cases Feinstein claimed. Add in the federalism-related constitutional avoidance cases, and we're still a ways off. Given all the expansions of federal and Executive power over the last 10 years, and the hundreds of cases in front of the Supreme Court, the Court has not been able to rouse itself more than a handful of times to declare that the feds have exceeded their powers under the Constitution? Bummer.